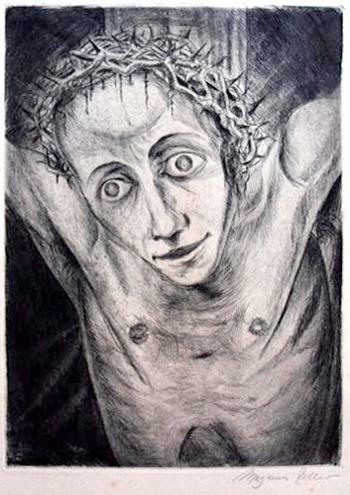 „Gekreuzigter“, 1922, drypoint on paper. Magnus Zeller was born in 1888 in Biesenrode close to Mansfeld. He began his studies at the Studios for Painting and Plastics at Lovis Corinth“s class in Berlin. His first exhibition was 1912 at the „Berliner Sezession“. He became member and later on, in 1914 member of the „Neue Sezession“. He took part in an collective exhibition at the gallery of Paul Cassirer. During WWI he served the military but secretly produced anti military lithographs. Zeller became teacher at the art school Pallas in Dopat, Estland in 1923. He participated in several exhibitions. In 1935 he was awarded the Rome-award. Half a year he stayed at the Villa Massimo in Rome. With the new regime, he was suppressed by refusing him the obligatory coupons for painting material. In 1938, 8 of his works were confiscated in the campaign „degenerate art“. After the war, Zeller lived in Hamburg and Caputh (eastern Germany). He died in 1972 in east Berlin. Jessewitch, Rolf and Schneider, Gerhard (Hrsg. ): Entdeckte Moderne, Boenen/Westfalen, 2008.